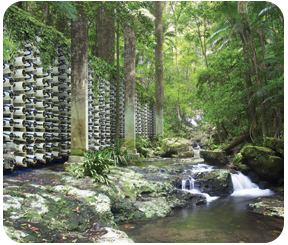 DOW FilmTec ECO Low Energy High Rejection Reverse Osmosis Elements | Applied Membranes Inc.
DOW FilmTec ECO elements feature next-generation membrane technology offering the highest quality permeate at 30% lower energy consumption. By using new membrane chemistry and low dP feed spacers, DOW FILMTEC ECO elements are able to help deliver significantly lower energy costs and reduced chemical consumption in downstream polishing costs. 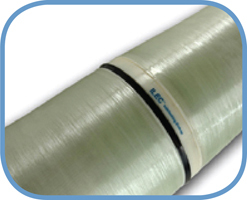 With a new industry-leading performance rejection of 99.7% at 150 psi, DOW FILMTEC ECO elements provide robust performance over a longer element life. At highest quality, the elements deliver 40% lower salt passage at 30% less energy when compared with standard RO elements. Plants that switch from conventional RO elements to DOW FILMTEC ECO elements enable lower energy usage and reduced regeneration costs. Provides most effective cleaning performance, robustness and durability due to its widest cleaning pH range (1-13) and chemical tolerance. 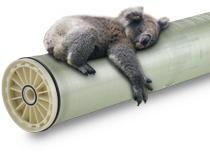 Reliable and long-term seal integrity – The single, non-sliding seal reduces the number of potential leak sites and is evenly compressed upon installation. Leak-tight performance – The iLEC design eliminates the possibility of o-rings being rolled from their grooves or pinched and damaged during operation. Lubricant-free operation – Omission of o-ring lubricant to preserve permeate quality, such as in ultra-pure water applications, will not compromise sealing performance. Backward compatibility – Compatibility with existing hardware is maintained. The smooth inner bore located at each end of the permeate collection tube is unchanged, permitting insertion of sliding couplers and existing vessel adapters. The net length of the elements, when connected, remains 40 inches. Reduced permeate pressure drop – Internal couplers and vessel adapters account for more than 70 percent of the permeate-tube pressure drop in some systems. The interlocking endcap design minimizes these restrictions, imposing less permeate backpressure. ECO Platinum elements provide improved hydraulic balance, increasing system energy savings. ECO Element Permeate flow and salt (NaCl) rejection based on the following standard test conditions: 2,000 ppm NaCl, 150 psi (10.3 bar), 77°F (25°C), pH 8, 15% recovery. Flow rates for individual ECO elements may vary but will be no more than +15%. Stabilized salt rejection is generally achieved within 24-48 hours of continuous use; depending upon feedwater characteristics and operating conditions. Membrane active area guaranteed ± 3%. 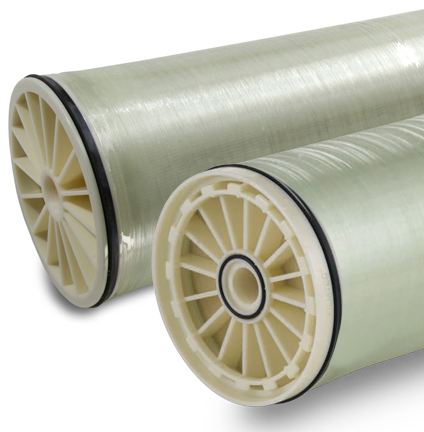 FILMTEC ECO’s new advanced thin-film polyamide membrane chemistry provides high salt rejection at lower pressures than previously possible. New LDP (Low Differential Pressure) feed spacer lowers pressure drops for increased productivity and lower fouling impact. 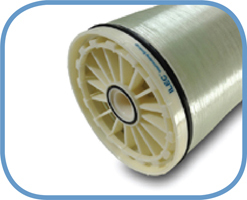 All models are offered in both standard end cap configuration and FilmTec's proprietary iLEC interlocking style for direct connection of membranes in multi-element housings. DOW FilmTec ECO Elements are ideal for reverse osmosis plant managers and operators dealing with controlled pre-treatment waters who are looking for a state-of-the-art solution to tackle tough CAPEX and OPEX challenges. Reliable, energy efficient operations with the long-lasting performance required in mobile field location units.